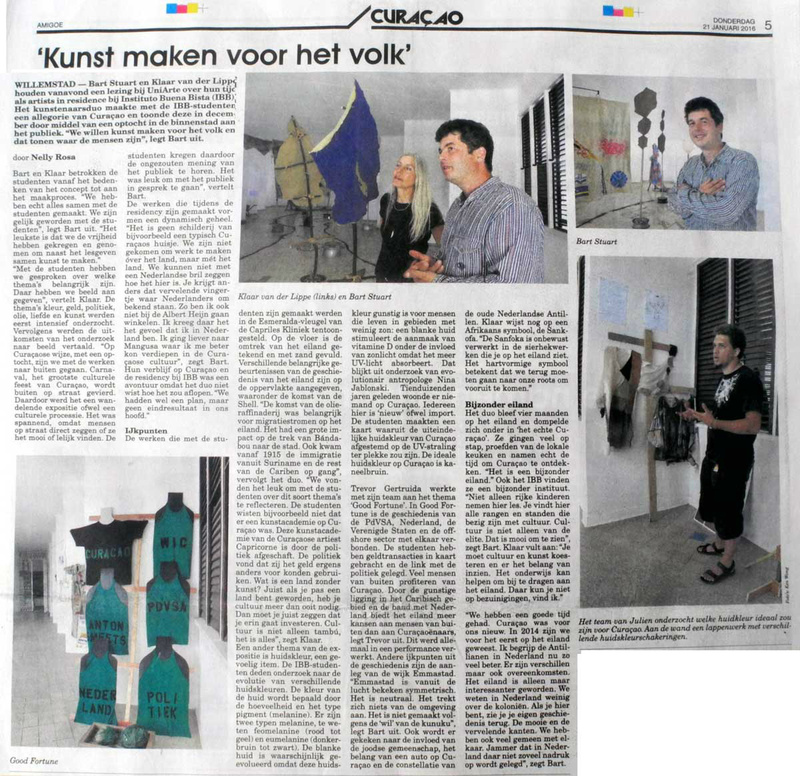 Interview in national paper AMIGOE about our art and praxis. headline above article: The people's art. A very nice interview and look in our 'kitchen'. 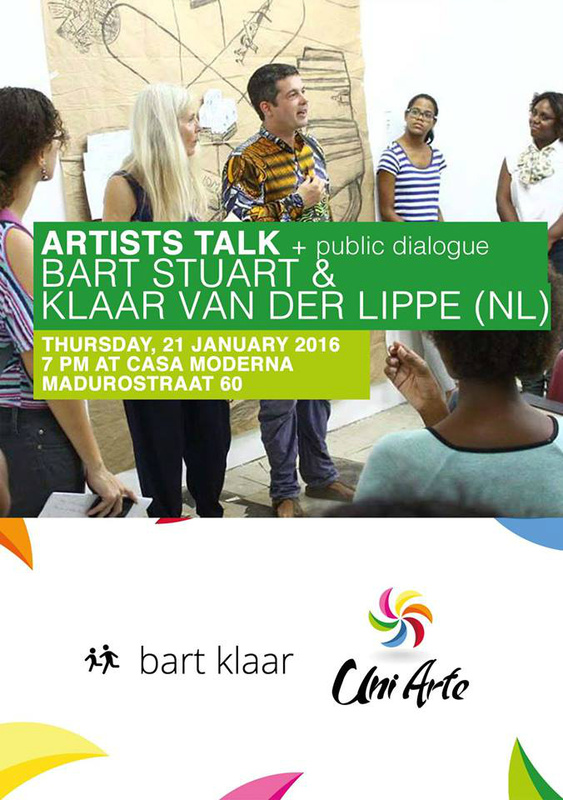 Public talk by Bart & Klaar at opcoming artistrun space Uniarte in Punda. Uniarte hosted an evening with us just before we took off to Amsterdam. The format was an artisttalk as a reflection about our IBB residency and a public dialoque about our content. It was a special evening, the beamer that was arranged broke down and left us doing what we are good at: Improvise! With no PPT but full of fire we led the audience have a taste of our spicy topics and perspectives. After our show we had a good interaction with the participating members of the audience. As a wonderfull thankyou gift present students of IBB gave us a book sharing their view/ opinion about us and our collaboration process with the student community. It felt heartwarming and gave us inspiration to come back! And another newspaper "EXTRA" on the public talk at Uniarte. 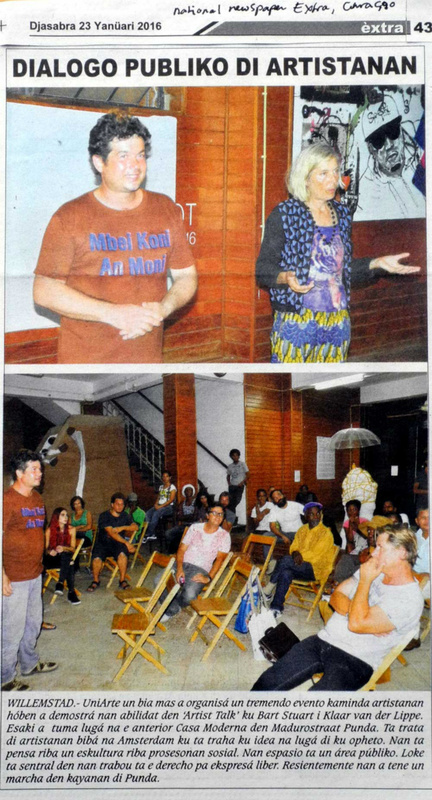 This time in a Papiamentu Newspaper on the island, good impressions of the evening.The T-shirt Bart is wearing says: Mbei Koni an Moni- saramacaan for Make Knowledge, not money.